Last week we released IDA 6.2 and Hex-Rays Decompiler 1.6. Many of the new IDA features have been described in previous posts, but there have been notable additions in the decompiler as well. They will let you make the decompilation cleaner and closer to the original source. However, it might be not very obvious how to use some of them, so we will describe them in more detail. This is probably the simplest new feature and can be used without any extra preparation. Sometimes the compiler stores the same variable in several places (e.g. a register and a stack slot). While the decompiler often manages to combine such locations, sometimes it’s not able to prove that they always contain the same value (especially in presence of calls that take address of stack variables). In such cases the user can help by performing such a merge or mapping manually. Choose the right-hand variable from the list. Once decompilation is refreshed, both the left-hand variable (v1) and the assignment are gone. Now we have only one variable – the incoming argument. 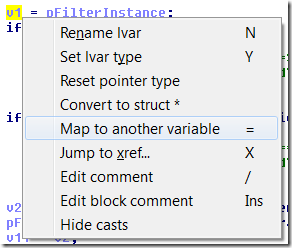 You can map several variables to the same name, if necessary. Made a mistake or mapped too much? It’s simple to fix. 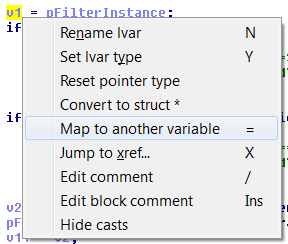 Right-click the wrongly mapped name and choose “Unmap variables”. Then choose the variable you want to see again. This feature, naturally, only applies to unions. That means that you need to have union types in your database and assign the types to some variables or fields. Since we know we’re in a DeviceControl handler, it’s likely the code is inspecting the Parameters.DeviceIoControl substructure and not Parameters.Create. Right-click the field and choose “Select union field”, or place cursor on it and press Alt-Y. This macro is commonly use in Windows drivers to get a pointer to the parent structure when we have a pointer to one of its fields. Change type of v6 to be _STREAM_OBJECT*. The decompiler will detect that the expression “lines up” and convert it to use the macro. Right-click on the delta being subtracted (-36), select “Structure offset” and choose _STREAM_OBJECT from the list. N.B. : currently you need to refresh the decompilation (press F5) to see the changes. We’ll improve it to happen automatically in future. 4. Kernel and user-mode macros involving fs segment access. On Windows, the fs segment is used to store various thread-specific (for user-mode) or processor-specific (for kernel mode) data. Hex-Rays Decompiler 1.6 detects the most common ways of accessing them and converts them to corresponding macros. However, this functionality requires presence of specific types in the database. For user mode, it is the _TEB structure, for kernel mode it’s the KPCR structure. Hint: the easiest way to get _TEB or KPCR types into your database is using the PDB plugin. Invoke it from File|Load file|PDB file…, enter a path to kernel32.dll (for user-mode code) or ntoskrnl.exe (for kernel-mode code), and check the “Types only” checkbox. PDBs for those two files usually contain the necessary OS structures. We hope you will like these new additions. Note that the version 1.6 includes even more improvements and fixes, see the full list of the new features and the comparison page.